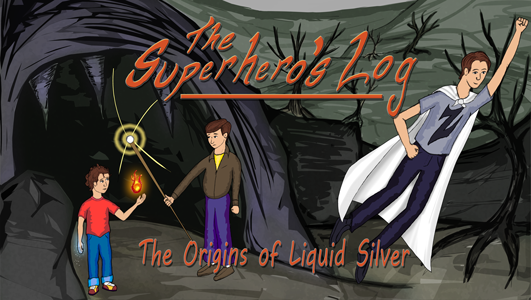 With great pride I would like to announce the publication of The Superhero’s Log: The Origins of Liquid Silver. This self published novel has been a facet of The Epic Beyond, under the moniker “The Liquid Silver Project”. This is the first book in a series of young adult fiction novels. It is available for print and download. Growing up on Long Island, Zander and his younger brothers Nicholas, and Steven were relatively normal children. They go to school, deal with bullies, and tell each other superhero stories. When a playground rivalry leads them to discover a valley hidden in their their home town, the three boys inadvertently unleash an ancient evil trapped there. They encounter a super-powered mad man named Zelius who wishes to control their minds and destroy the world. Finding powers, the likes of which they never imagined, their superhero stories come to life. Can their fraternal bonds save them or will Zelius’s sinister machinations lead to ruination of everything?